Female MLAs from the Green Party, Alliance and the UUP have dismissed First Minister Arlene Foster’s claims that calls for her to stand aside were motivated by misogyny. However, the female MLAs Claire Bailey of the Green Party, Naomi Long of the Alliance Party, Michelle O’Neill of Sinn Féin and Jenny Palmer of the UUP have rubbished those claims. Responding to the First Minister’s misogyny claims, Clare Bailey MLA said: “The First Minister’s misogyny claim is a terrible attempt to detract from her central role in the RHI fiasco. “Misogyny is the hatred of women. I supported the no confidence motion in the First Minister but I don’t hate her as a women or indeed as a person. “What I do hate is £490 million potentially wasted and the First Minister’s attempts to avoid any responsibility for a scheme she presided over and promoted. “Moreover, I refute the sudden awareness of misogyny when Arlene Foster has done little or nothing to promote gender equality during her time in politics. Indeed she has slapped down attempts to modernise abortion law reform in Northern Ireland. She has shown little interest in promoting the rights of our LGBTQ citizens and appears unconcerned that women make up a mere 28 percent of MLAS. UUP MLA Jenny Palmer described the misogyny claims as a ‘distraction’. She said: “It’s no surprise that the DUP are clearly desperate to deflect from the biggest financial scandal in Northern Ireland’s history. It is a mark of their arrogance that they seem totally indignant that anyone would question their role in the waste of over £400m of public money. “I know exactly what it is like to be the victim of personal attacks for daring to stick your head above the parapet. “That is not the same as being held accountable for your actions. Where was Arlene Foster whenever I was being harangued by Sammy Wilson and Stephen Brimstone was telling me that the party comes first? Her silence was deafening. “Arlene Foster can continue to scramble around and point the finger at everyone else, but that will not deflect from the fact that her fingerprints are all over the RHI debacle. “This is just the latest ham fisted attempt by the First Minister to reshape the debate and pivot away from the valid questions being asked of her. Alliance MLA Naomi Long said the first minister was merely being held to account as anyone in her position would be. She also attacked the records of the DUP and Mrs Foster’s old party, the UUP, on promoting female representatives from within their ranks. 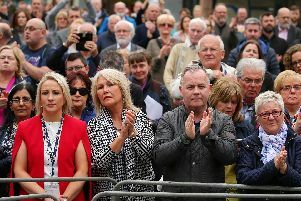 She said: “I’m surprised Arlene sees this as misogynistic as opposed to being held to account in the same manner as her male predecessor in a previous scandal of much lesser financial importance (and who also claimed to have done nothing wrong, but stood aside to allow investigation). “It is particularly suprising from a woman who has been a member of two political parties with atrocious records on the promotion of women within their ranks, Arlene being a notable exception, and who joined the DUP at a time when members of the party deemed it acceptable to moo at members of the Women’s Coalition and other female elected representatives in debates. Sinn Féin MLA Michelle O’Neill said: “This is not a gender issue nor is it an Orange and Green issue. This is about a financial scandal, which has the potential to cost the public purse hundreds of millions of pounds. “Arlene Foster is trying to divert attention away from getting to the truth and holding those responsible to account. “That is the basis for Sinn Féin calling for Arlene Foster to stand aside, it is not an issue of her gender. “As the minister responsible for the design and operation of this scheme for three years she has a clear conflict of interest. “Sinn Féin will not tolerate any cover up of the RHI scandal. “The key to this is to speedily establish an effective, independent investigation to get to the truth, which stops the loss of public money and restores confidence in the political process.